Parody accounts are one of the prevailing cultural forms of Twitter. The combination of lazy anonymity and the 140-characters-of-wit format make it the perfect place to assume a character and play it out to a potential audience of millions. Back in the prehistoric days of Twitter, one of the first parody accounts to come to my attention (and hold it) was @osbornedrunk, wherein our erstwhile Chancellor, Gideon George Osborne, was beautifully portrayed as a bumbling idiot, bouyed by frequent hits of vodka jelly and magic mushrooms. Drunk George ran his course and the author moved on to other things, briefly reappearing as @osbornedead around Halloween, but effectively the horrific bufoonery of the real-life Osborne outpaced the character and he quietly retired. It turns out that the creator of @osbornedrunk is a friend of mine, a fact revealed accidentally, at the great crossing of the Brighton Ley lines (hail Eris). With the upcoming General Election, it seemed appropriate that George should come out of retirement and play out the last fevered month of the campaign. After all, parliament has now been dissolved, leaving plenty of time for vodka jelly. One of the defining features of this government has been the revelation that we are all being surveilled, apparently for our own good. 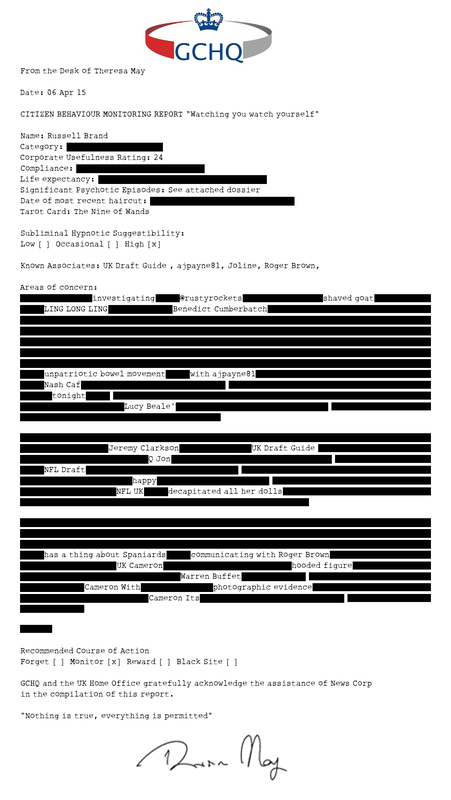 This project brings this to our attention by generating a redacted report about anyone who sends an @ message to @DrunkGeorgeOsb. The reports are generated by scanning your last 100 tweets and finding out who you’ve been talking to and what they are talking about. 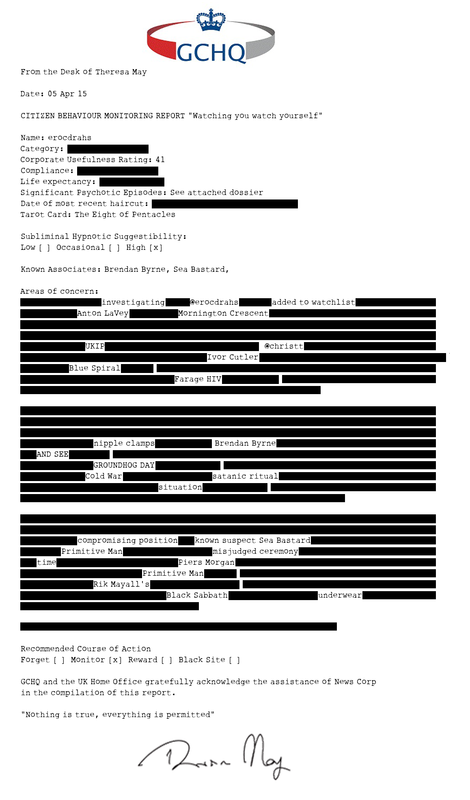 When presented with a redacted report one cannot help but imagine what words might be behind those black oblongs, even more so when the report is about ourselves. In a sense, drunk George has now become a cyborg, partly controlled by his author, and partially by algorithm.